Pad Thai in Ko Samet, Thailand. Photo: Anders Thorsell. 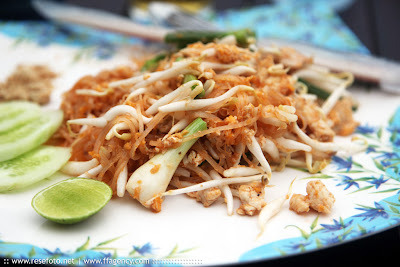 Pad Thai, "fried Thai style" is a dish of stir-fried rice noodles with eggs, fish sauce, tamarind juice, red chilli pepper, plus any combination of bean sprouts, shrimp, chicken, or tofu, garnished with crushed peanuts, coriander and lime, the juice of which can be added along with Thai condiments. Pad Thai is one of Thailand's national dishes.